This tutorial covers UMA grant security using the GLUU-UMA-PEP plugin and the Gluu Server. 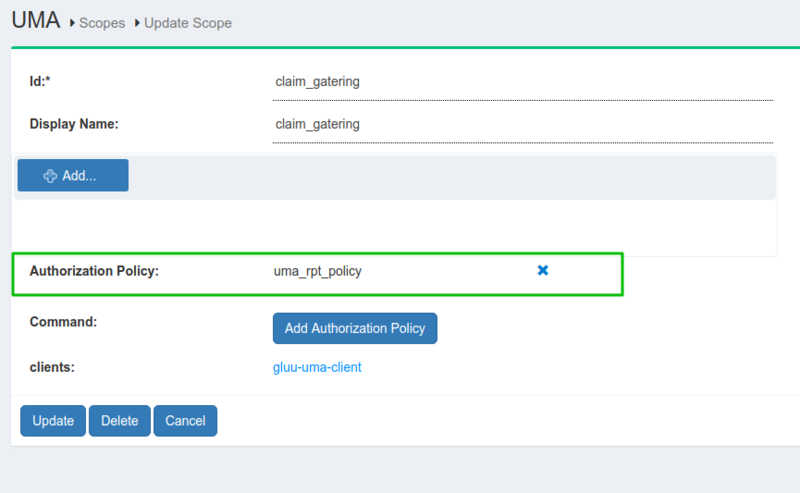 There are two different ways to apply UMA security, with Claim-Gathering-flow and without Claim-Gathering-flow. The demo is a Python CGI script that can be deployed on any CGI-enabled server. Plugin configuration can be done either via REST calls or via the Gluu Gateway web interface. Configure plugin on Service, Route and Global. There are several possibilities for plugin configuration with services and routes. More information is available in the Kong docs, and configuration detail descriptions are available in the Gluu Gateway docs. 443 Kong SSL Proxy Endpoint. Kong by default provide 8443 port for SSL proxy but during setup it change into 443. The following tutorial demonstrates plugin configuration for a Service. Follow the steps below. Register your upstream API as a Service. For more details, see the Gluu UMA PEP service docs. For this demo, you'll need to add two different services with different names. You can use this live test API, https://jsonplaceholder.typicode.com. For a proxy, you need to add a Route to the Service. For more details, see the Gluu UMA PEP route docs. 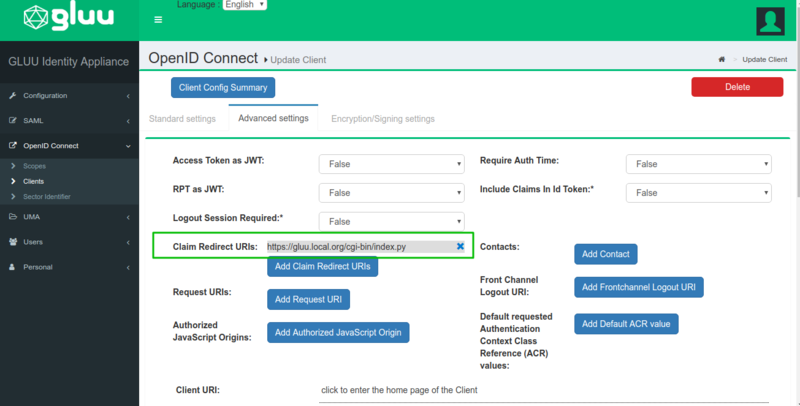 Add the first route in claim_service with gathering.example.com as the host. Add the second route in non_claim_service with non-gathering.example.com as the host. Configure Gluu-UMA-PEP with UMA scopes and resources. See more details in the Service Plugin docs. 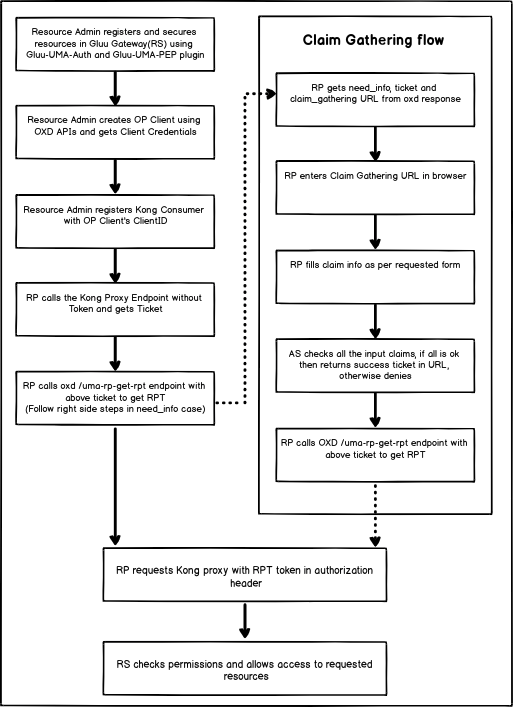 Once you have an OP client, use its client_id for Kong Consumer registration. . When you make this call, you'll receive a ticket in the WWW-Authenticate header with a permission ticket. Get a client access token using consumer credentials. When you make this call, you'll receive a Consumer access token. When you make this call, you'll receive an RPT access token. There is one uma_rpt_policy included in the script. During authorization, it checks County=US and City=NY. If you want to change the value, then you can update this script or add your own new script. For more details, take a look at Gluu CE Documentation. Update the consumer_op_client with claim_redirect_uris in CE. Add your CGI script URL. When you make this call, you'll get a need_info ticket and a claims gathering URL for user redirection. You have to add your claims redirect URI as a URL query parameter. You may need to add your claims redirect URL to your client configuration in CE. The next step is to request a claim gatering URL in the browser and add country and city data. Per default uma_rpt_policy, you need to enter US in Country and NY in City. If you change location values in the script, enter corresponding values here. If all claims are correct, the Gluu Server will redirect you to the claim redirect URI with a new permission ticket. Download the Demo from the Gluu-Gateway repository. By default, the UMA without claim gathering flow is executed. If you want to execute UMA with claims gathering flow, add claim=true parameter to your URL. Put all 3 files in /usr/lib/cgi-bin and give them 755 permission. host_with_claims Kong Router object's host which you configure for claim gathering flow. As per above configuration, its value is gathering.example.com. host_without_claims Kong Router object's host which you configure for without claim gathering flow. As per above configuration, its value is non-gathering.example.com. claims_redirect_url Claims redirect URL. As per above configuration, it is <your-server.com>/cgi-bin/index.py.